oh wow! It is BEAUTIFUL! You've done such an amazing job. I absolutely love the fabric and coordinating sash. It fits perfectly and you look fabulous in it! great job!! Your dress is gorgeous, you really do look fresh and girly, roll on Springtime. I have that pattern, ready and waiting for some attention so thank you for the advice and links which I shall definitely be checking before I set off! It's gorgeous Jane, the fabric choice was inspired, I love the contrasting sash. I completely missed the fact there wasn't a wrap at the front, but at the back. I much prefer this neckline. Sorry I didn't make it yesterday, looking forward to reading about it. 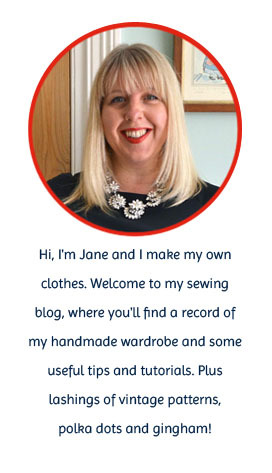 I've got to give it to you Jane, you're a gal with fabric taste after my own heart ;o) Love the whole thing! The fit is so perfect, would never have guessed you had fitting issues! This looks great, and it's interesting to hear your thoughts on the project as I'm also participating in the sewalong. I also got quite stressed with the fit issue but I think you should be very pleased with how yours turned out. Lovely fabric too! This is lovely, Jane - the fabric is gorgeous and the contrasting sash really sets it off. It looks like it fits beautifully too. Perfect for spring - if it ever arrives! Wow where did you get the fabric and pattern from? It's simply lovely, it really is. That is an absolutely gorgeous make. Which Ebay supplier did you get that fabric from? I may have to order some. The red sash is inspired. You look so pretty! Love, love, love it. You can see it's a really good make. Does it stay together well during the wearing. Hmmm. I may have to change my mind about this pattern. Great to meet you yesterday! Such a pretty dress and fabric! Well done you. I'm not actually following the sewalong but great that you managed it without the rest of the posts! Your Crepe is gorgeous and you have inspired me to get a wriggle on actually starting mine!!! LOOKS GREAT. I'm also frustrated with the painfully slow pace...maybe I'll follow your lead and just finish it on my own! This is just lovely! The fabric you chose suits the dress and it looks like the fit is perfect. You look really nice in this. Great job on completing this dress - ahead of schedule, too! Lady Cherry and Karen, the fabric was from an eBay seller called Favourite Fabrics. The fabric is called Eva but I think I got the last of the grey, she also has it in cream or mink though and has lots of other cotton lawns, here's the link http://stores.ebay.co.uk:80/FAVOURITE-FABRICS/COTTON-LAWNS-/_i.html?rt=nc&_fsub=12389340&_sid=176126884&_trksid=p4634.c0.m14.l1513&_pgn=1. Wooh, that is very gorgeous indeed and a perfect fit! I love the contrast between the fabric and the red. Will you be making another one now that you have it all figured out? Also you say you took out the polyester 'imposter' - did you just go ahead without it, or did you replace with the silk one? Jane, it's so beautiful. I love it - so graceful, girly and elegant. And I loved your impatience with the sew-along...I really want to be a joiner, but like you, I know that I'd end up getting frustrated and racing ahead (so it made me laugh that you count this as 'one sew-along completed'....surely that's a sew-forward?). The dress looks an absolutely perfect fit, so I'm very admiring of your alteration skills - I wish that patterns would come with options not only for size, but also for body type to avoid such drastic overhauls having to be undertaken. OMG! Its so beautiful! You look great! I bet you're so proud of yourself, can you make me one?? Very nice work on your dress! Regarding the time it took to baste the underlining to the fabric, don't look at Gertie's latest sew-along post about glue ;) Oh well, I'm sure you learned tons by doing it the way you did! Love the colors. Oh, and I was the one who asked way back when about your Lady Valet dress form. Well, I ended up buying it and love it! It's so nice to have a dress form in a neutral that adjusts AND has a steady stand. Your dress looks beautiful! The colours & print are so pretty. I think you SHOULD go skipping through a field of flower just because. Why not, right? I'll be honest, I'm still working on the bodice fit (in addition to life getting in the way). Eventually I'll get it done, but it is so nice to be able to read the experiences of others. Beautifully done! Do you think you'll make this again in another colourway? Oh I just LOVe that fabric and the combination with red. Beautiful.